Okay, I'm back. WHEW. This one will take a little while to digest. And while I do like planning parties, I was a little unsure of how to proceed. October can be a bit dicey weather-wise, so having a party in the park didn't seem like the best idea. Instead, we opted for a shin dig in our tiny quaint apartment, keeping the guest list small so as not to be overrun with children, thus leading Husband to exit for "a pack of smokes" & never return. Also, not that I was phoning it in this year, but I just didn't feel like spending hours pouring over Pinterest planning a theme & all the little details like I have in the past. But of course, I wanted the party to look like I had -- HA! 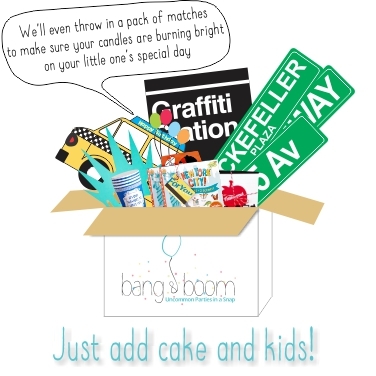 As luck would have it, two mom friends of mine, Lizzi & Gaby, have started a truly thoughtful & creative party kit business called Bang & Boom Parties. Essentially, you choose a theme for your child's party & a box is delivered to your door with EVERYTHING you need except the kitchen sink (or cake, in this case). Inside, you'll find all the decorations (garland, banner, balloons, cake toppers), tableware, thank you notes, guest wearables, activities, a custom shirt for the birthday kiddo, party favors... even matches & candles. Last but not least, a cake recipe (as well as a gluten-free option) & plenty of tips to make your party a success. They've truly thought of everything so that you -- mom extraordinaire -- can put a party together in 20 minutes with no stress in sight. Millie chose Bang & Boom's pirate theme, which was so much fun! As with all of their themes (check out Farm Fresh, their latest addition! ), Lizzi & Gaby's attention to detail & creative flair comes shining through. Birthday kid t-shirt & "gold" treasure for each guest to find. Reward: birthday cake! Always important to say thanks! More decorations to hang... I let the birthday girl put them where she wanted. Aarrrr! Party snacks before the pizza arrived. Another party activity: treasure box decorating! My big six year old. Waaaah! Party was a total success & as you can see above, we had a happy pirate on our hands. Thanks to Bang & Boom for making me look like a rock star! 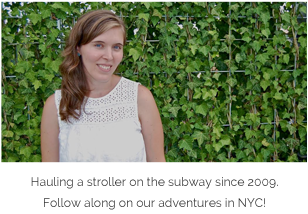 Consider supporting this local mom-owned business the next time your child has a birthday. And finally, I love reading this poem to my brand new six year old. Winnie the Pooh is truly the gift that keeps on giving! But not I am Six, I'm as clever as clever. Disclosure: I was given a party box as a promotional thank you & for review purposes. All opinions herein are my own.